Raised in the Pilsen and Bridgeport neighborhoods, Justice Jesse Reyes was the oldest of four children and the only one to attend college. In 1997, Reyes was elected an Associate Judge by his peers on the circuit court. In 2006, Reyes became the first Latino to lead the Illinois Judges Association. Reyes now has his eyes set on the Illinois Supreme Court. On Tuesday, Appellate Court Justice Reyes officially announced his candidacy to become a member of the Illinois Supreme Court at Hotel Allegro. 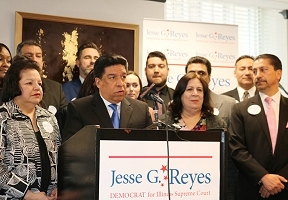 He was joined by former Illinois Attorney General and Lieutenant Governor Neil Hartigan who enthusiastically endorsed Reyes. Reyes was also joined by family, friends, colleagues and community members. “Today I formally announce my candidacy for the Illinois Supreme Court vacancy created by the retirement of Justice Charles E. Freeman. A jurist who served this State with distinction. An honorable man who was a friend and a mentor to many of us in the legal profession, he will be sorely missed. “As a descendant of immigrants and a product of a blue-collar family, I know of the struggles many people in the state of Illinois have to endure on a daily basis. I know what it means to have dreams, yet not know if you will ever be able to fulfill them because of your circumstances. Circumstances which you did not create or cause. But circumstances nonetheless you must endure merely because that is what you were born into. “As a child born and raised in Chicago, I was fortunate to be able to overcome these factors in my life and was able to fulfill my childhood dream of becoming a lawyer and then having the distinct privilege of becoming a member of the judiciary. “Think about it, one day I was working in a factory to help support my family, today I am an Appellate Court Judge about to embark on a journey that may take me to the highest court in the Land of Lincoln. As a result of these successes in my life, I always felt it important and incumbent to give back. To assist those who were seeking to fulfill their dreams. This sense of obligation guided me to public service. 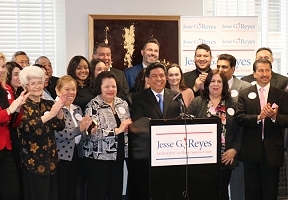 Reyes was elected to the First District Appellate Court on Nov. 6, 2012, becoming the first Latino elected to the Appellate Court in Illinois. Reyes is the founding member and the current President of Diversity Scholarship Foundation. He is also a founding member and the former President of the Illinois Judges Foundation. Reyes and his wife Terry live in Chicago’s Southwest side; their daughter Renee is currently a second-grade teacher.